(CBS/AP) CARLTON, Minn.  A Minnesota casino has cooked up a world-record bacon cheeseburger that's 10 feet in diameter and weighs more than a ton. The behemoth burger was served up Sunday at the Black Bear Casino Resort near Carlton. It tipped the scales at 2,014 pounds. 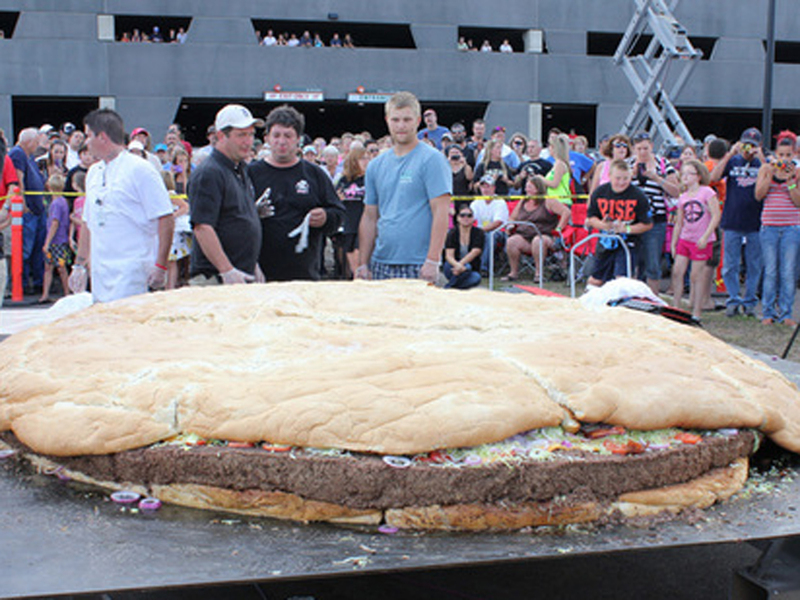 Guinness Records representative Philip Robertson verified the record for biggest burger. He called the feat a result of "remarkable teamwork" and said the burger "actually tastes really good." A Duluth News Tribune report says the previous mark was a mere 881 pounds, 13 ounces. Black Bear's burger included 60 pounds of bacon, 50 pounds of lettuce, 50 pounds of sliced onions, 40 pounds of pickles and 40 pounds of cheese. It took about four hours at 350 degrees to cook the patty andm ore than seven hours to bake the bun, the newspaper says, adding that an outdoor oven powered by propane torches and 15-foot steel skillets were specially-built for the feat. A crane was used to flip the burger.